"Exceptional living in a Park Setting "
This small one-bedroom suite has an attractive layout as well as 1 bathroom. Living and dining room are separate. We're conveniently located close to library and science centre as well as schools and shopping with the TTC at your door. Visit our immaculate building today. Book your showing at 416.425.7550! Exceptional living with over-sized suites and attractive layouts. Fantastic views overlooking the ravine in a beautiful park setting. We are conveniently located close to the library and science centre as well as schools and shopping. 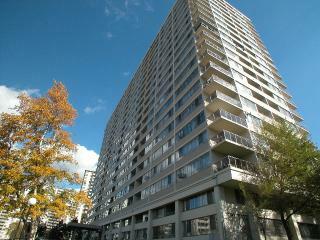 Easy access to downtown Toronto, the Don Valley Parkway, and the TTC is at your door. Our suites feature 1.5 baths and in-suite storage lockers. Some of our suites feature eat-in kitchens and 2 balconies. Visit our building today. Book your showing at 416.425.7550!